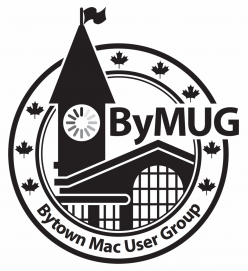 ByMUG: The Bytown Mac User Group of Ottawa – Page 34 – Over twelve years of Mac & iOS devices in a fun and social setting. For December’s meeting we are going to do a roundtable discussion of alternative email clients for the Mac and iOS devices, as well as plugin extensions for Mail.app. Then we will have a demonstration of iMovie by local author and filmmaker S.M. Carriere, just in time for holiday-video making. As always, bring your questions for afterwards! The meeting takes place on Sunday, December 1, 2013, at 1 p.m. at Patty Bolands, located at 101 Clarence Street (in Ottawa, Ontario). November’s meeting is going to be fun! We will start off with David showing Plex Media Server, then Tom will demo Eltima’s Airy, a YouTube video downloader, and then we’ll launch into the new hardware offerings and walk through the latest version of OS X, Mavericks.